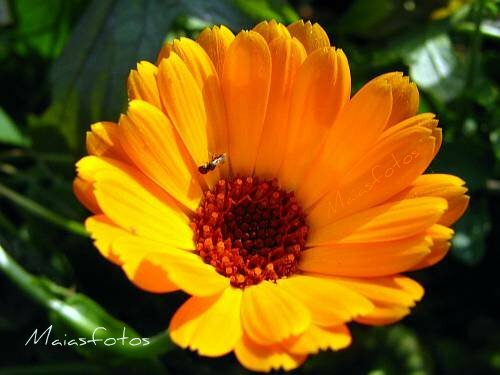 The Common Marigold - Calendula officinalis - is familiar to everyone, with its pale-green leaves and golden orange flowers. It is said to be in bloom on the calends of every month, hence its Latin name. Calendula, this powerful flower, is known to have anti-inflammatory and anti-bacterial properties, being used as a wound-healer or in skin infections and eczema. Pot marigold, on its other name, is known to be high in anti-oxidants that may help prevent skin cell damage caused by free radicals. Therefor, pot marigold flowers are used in several cosmetic and pharmaceutic preparations like skin creams, shampoos for oily hair and herbal mouth rinses. Last but not least, the brightly colored, orange-yellow calendula flowers are a great addition to any gardeen. plant.. here we call it Calendula..